Hicham El Guerrouj ( born 14 September 1974 ) is a retired Moroccan middle-distance runner. Born in Berkane, Hicham El Guerrouj’s first international triumph was at age 18, when he was third in the 5000 metres of the 1992 Junior WorldChampionships in Seoul, behind Haile Gebrselassie of Ethiopia and Ismael Kirui of Kenya. A year later, he was the #2 man on the Moroccan team at the World Junior Cross Country Championships. In 1994, he was a member of the Moroccan team in the 1994 IAAF World Road Relay Championships, which won the race in world record time. El Guerrouj rose to international prominence in the mid-1990s with near-record times in the s1500 metre and mile. At the age of 20 he finished second in the 1500 metres to then world record holder Noureddine Morceli at the 1995 World Championships in Gothenburg. In 1996 after setting a new personal best in the 1500 metres of 3:29.59 in Stockholm, he was considered one of the favourites for the Olympic gold. El Guerrouj competed in his first Olympic Games in 1996 at Atlanta. Running the 1500 metres final, as he was moving into position to challenge for the lead, he fell with 400 m to go and finished last in 12th place. He had been expected to challenge the world record holder and three-time World champion, Noureddine Morceli. One month later, at the Grand Prix final in Milan, El Guerrouj became the first runner to defeat Morceli over 1500 m in four years. In the following years, El Guerrouj became the only middle distance runner to win four consecutive world titles in 1997, 1999, 2001, and 2003. El Guerrouj set two world indoor records at the start of the 1997 season, starting with a 1500 m record of 3:31.18 at the Sparkassen Cup, beaten 22 years later, in 2019 by Samuel Tefera. He also setting a new indoor best of 3:48.45 in the mile run at the Indoor Flanders meeting a few weeks later. In 1998 in Rome, El Guerrouj broke Morceli’s 1500 m world record (3:27.37) with a time of 3:26.00. In 1999, also in Rome, El Guerrouj broke the world record in the mile set by Noureddine Morceli in 1993, with a time of 3:43.13. Noah Ngeny of Kenya, who ran second, was also under the previous world record with a time of 3:43.40. This was the first time in over 40 years that two men had bettered the mile world record in the same race. Later that season he set a new world record over 2000 m in Berlin at 4:44.79, bettering the previous mark set by Morceli by more than three seconds. He also ran the second fastest 3000 m ever in Brussels. At the Sydney Olympics, El Guerrouj was favourite to take gold but finished second in the 1500 metres, behind Noah Ngeny, a talented Kenyan runner at the peak of his career who had run as El Guerrouj’s pacemaker when El Guerrouj ran his 1500m world record in Rome in 1998. 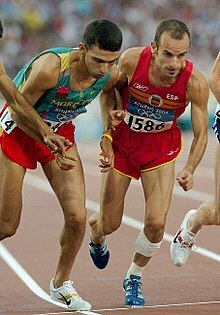 El Guerrouj successfully defended his 1500 m title in the 2001 and 2003 World Championships and came close to breaking his own 1500 m record in Brussels in 2001 with a time of 3:26.12. He also won 3 consecutive IAAF Golden League prizes in 2001, 2002 and 2003. He was the only middle distance athlete to produce the winning streak necessary to be entitled for a share of the jackpot of 50 kilograms (1,608 troy ounces) of gold (2000–2002) or US$1 million (1998–1999, 2003–present). He remains the only athlete to have won it three times in a row. In 2003, El Guerrouj set a personal best of 12:50.24 in the 5000 metres, which is the 16th fastest ever in the event. Later in the year, at the World Track & Field Championships, he finished a close second to Kenyan Eliud Kipchoge in the 5000 metres, adding a silver to the gold he had previously won in the 1500 metres. After a relatively poor start to the 2004 season that included slow times and an 8th-place finish in a 1500-metre race in Rome, El Guerrouj entered both the 1500 metres and the 5000 metres at the 2004 Summer Olympics in Athens, Greece. Only 20 days before the Olympic final, 2000 Olympic bronze medalist Bernard Lagat ran the fastest 1500 m in 2004 (3:27.40), narrowly defeating El Guerrouj (3:27.64) at the Weltklasse Zürich meet on August 6. On August 24, in the final straight of the Olympic 1500m final, El Guerrouj beat Lagat by 0.12 seconds, winning the gold medal. In the finale, entering the home straight El Guerrouj led, only to be overtaken by Lagat- and then El Guerrouj re-took the lead a few strides from the line. Four days later, El Guerrouj won the 5,000 m final with a time of 13:14.39, preventing Kenenisa Bekele from achieving the 5000 m/10000 m distance double, last achieved by Ethiopian Miruts Yifter in 1980 Moscow Olympics. El Guerrouj became the first man in 80 years to win both 1500m and 5000m titles in the same Olympics, previously achieved only by the « Flying Finn » Paavo Nurmi in 1924. Having fulfilled his sporting ambitions, El Guerrouj never competed internationally again and announced his retirement on May 22, 2006. His sporting career is marked by numerous recognitions such as the award to humanitarian effort from the International Association of Athletics Federations (IAAF), which he received in 1996. He is also a UNICEF Goodwill Ambassador. El Guerrouj was named IAAF World Athlete of the Year in 2001, 2002 and 2003 after remaining unbeaten in more than 20 races, becoming the first man to win the award in consecutive years. He was also named best athlete of the year by the athletics journal Track and Field News in 2002. In 2003, he was elected as a member of the IAAF Athletes Committee. On September 7, 2004, El Guerrouj was decorated with the « Cordon de Commandeur » by King Mohammed VI of Morocco. In the same year, he was awarded the Prince of Asturias Awards. He was a member of the International Olympic Committee Athletes’ Commission from 2004 to 2012. Hicham El Guerrouj is today an Ambassador for Peace and Sport, a Monaco-based international organization, as well as a member of its « Champions for Peace » club, a group of 54 famous elite athletes committed to serving peace in the world through sport.